I really enjoyed Hadley's and Oliver's interactions. They played well off of each other and you could tell that they were comfortable and having fun with each other. The TWIST to OLIVER's story (see what I did with that pun there?! *pats self on back*) definitely surprised me...but what I liked about both his and Hadley's stories is that interwoven into this fairy tale 24 hours is real life. It's not like everything stopped or suddenly became okay because they met. What they were facing at their destinations was still heavy and hard. But meeting each other brought some light and perspective to their situations, and they were able to share the load of their sadness. So while this book was a fairy tale -- it was a real life fairy tale. And that is the type of story I can believe in. 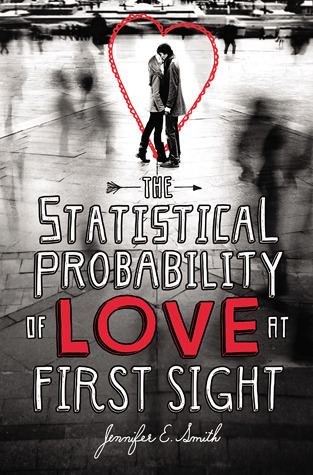 Read BookNerd Teri's review of The Statistical Probability of Love at First Sight on her blog. How do you guys read so fast? Three hours?? I REALLY need to read this book. I have heard great things about it.